This is more of an idea or a guide than a recipe post. Amounts can easily be adjusted according to the number you plan to serve. 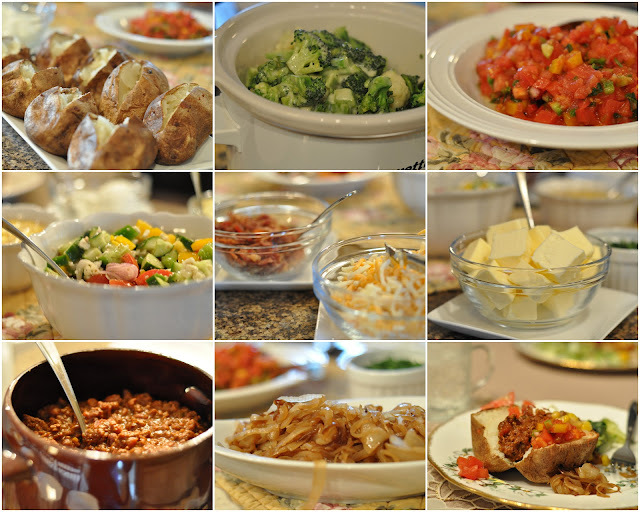 It was the first time we hosted a potato bar for dinner and we all enjoyed it very much! Obviously there are many more possibilities for toppings, such as salmon and Hollandaise sauce or pulled pork and coleslaw. You could make it a vegetarian bar or use sweet potatoes as well. This is an easy, economical way to serve a large group, especially if you make it a potluck and guests each bring a topping, ready to go. Set out all the serving dishes on the bar, thinking through what goes into each dish and most practical order. Scrub potatoes, let dry, set out on parchment paper lined cookie sheet (extra large size). Prepare chili and keep warm in slow cooker. Cut broccoli and cauliflower into bite size pieces and set in pot ready to steam. Prepare veggies for Greek salad, tomatoes etc. for salsa, chop chives, and grate cheese. Refrigerate all. Place canned corn in pot or dish, ready to heat. Caramelize onions (cook in heavy pan with a bit of olive oil, stirring often until golden). Set aside. One and one half hours before dinner, brush potatoes with olive oil, poke with fork and place in 400° F oven. Lightly steam broccoli/cauliflower and prepare cheese sauce. Mix and put in small crock pot, if desired, to keep warm. Mix Greek salad, cook corn and re-heat onions. Set out all ingredients, as well as butter, sour cream, salt and pepper. Just before serving, cut a long slit into top of each potato and squeeze both ends toward center, to open the potatoes. Learn something new about someone and don't forget to have fun! Wow -- what a great and economical idea for a buffet!! I love how you presented this. Thanks for always helping me with my hospitality (blessing). Would make for a yummy summer BBQ. Have used the potato bar for women's groups often. Like the new idea of the Greek salad will use it in a couple of weeks with a group of quilters. I usually also serve some kind of soup with my potato bar. Thanks for the new ideas. I've done this for years for staff at school.When washing 50 or more potatoes I run them thru the dishwasher. Tostada bar is also another idea! The potatoes will stay HOT for hrs. if you put them in a ice chest(minus the ice)! I love your instructions and plan to put this on the table! So helpful. I love this meal - it's one of the most favourite meals that is served in our college cafeteria - the students LOVE it! The administrative offices can smell the bacon as it's being prepared and then we all know it's "top a potato" day! Yes, Sara - we did do this for our Christmas gathering and my personal preference would definitely be an Adora potato over a russet, not quite as dry a potato. Not sure if you have access to adora's out in B.C. The above comment was from Sheila T.
What a great idea! We have home study groups for church and they do potlucks alot. This would be a great idea for that! I have done these often too, but the biggest group was a group of about 50 collage age young adults that came thru our house on a progressive supper. Very fun! I really like some of the tips of the others who commented and I like your time-line Anneliese. I am never good at estimating how much time things take. My little idea is that we use creamed corn instead of kernel corn. What a great idea for a potluck. I think this meal would make everyone happy- meat eaters and vegetarians. Plan to use this at our church soon! I'm so excited to use this idea (with baby potatoes) for a baby sprinkle I'm hosting in a few weeks. Thanks! We had such a fun family Mother's Day dinner. About 22 of us. I used your timeline and menu for our potato bar. It worked great! I started at 2pm to get things ready, and had it ready by 6pm. Yes, it takes a while to make and chop everything, but it was fun. All the while my Mom and daughter were also in the room, reminising and looking at photos, before the big group arrived. Also served BBQ farmer sausage, greek salad (as you suggested) and brocolli salad (thus the exra time). Happy Mothers Day to you too, Anneliese! Thank you, Lorrie! So good to know and I love the idea of BBQ farmer sausage to go with it. Sounds like you had a bit of work, hosting, but happy memories were made! I am working together with a partner in Care Ministry at our kids' Elem School... we do 3 Staff Luncheons a year... and this idea is sounding so fun! We'll see what my partner says...! I'm thankful for the "cook for a crowd" section! We'll be looking at serving about 75! Learning curve, here we come!! All the best, Jen! This really is a good one for a crowd with benefits, such as that you can prepare ahead, it's fun and easy to clean-up. I am sorry I do not know about washing potatoes in the dishwasher. There was a comment, however, from someone who has done it. Do you have a commercial kitchen to prepare in, would be one of my questions, but the nice thing is that you can prepare the potatoes to be ready to go into the oven, the day ahead already. You can do a lot of the prep ahead. All the best! Would love to hear how it turns out.